To begin with, thank you from the bottom of our hearts for your support. 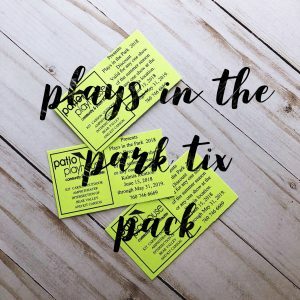 Patio Playhouse is a volunteer-run organization that continues to strive to create better theater, a better patron experience, and to reach out into the community in a meaningful way. Your support this year and in years past has helped us in all three areas, allowing us to win 10 Aubrey Awards (San Diego Association of Community Theatre) including Best Production of a Musical, helping us partner with other non-profit organizations via fundraising and awareness campaigns and leading to the development of a positive reputation for our community organization advocacy. You can rest assured that this theater – your theater – is better because of your patronage. With that in mind, this year, in an effort to improve our patron experience, we have restructured our “season ticket” offerings. Although they have always offered tremendous cost savings, we couldn’t resist the opportunity to simplify the offerings for YOUR benefit! And so, without further ado, we are excited to introducer our new offering, Tix Packs. Tix Packs are your way to support our theater while still earning all of the perks of being a regular patron and getting 15% off the listed ticket price. The idea is simple: we have broken our season into two segments. The first segment will be covered by our Park Tix Pack. This pack includes three tickets that are good for ANY of our shows this season, regardless of venue (Kit Carson or Kalmia). The second segment is our Downtown Tix Pack, which features four tickets which can be used ONLY at the Kalmia venue. Both of these Tix Packs are value priced at 15% off our list price for the ticket quantity… a great deal! 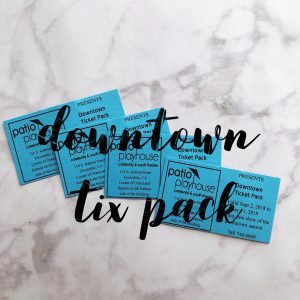 However, to sweeten the pot for those who love to attend our shows both at the amphitheater and downtown, we are excited to additionally offer a third option, the Best Buy Pack which combines the Park + Downtown options above and knocks an additional 5% off the price. These packs are available NOW by clicking here. We did want to acknowledge that we have had to implement a slight increase in the cost of tickets to our downtown theater for the coming year. While we have been able to enjoy fixed prices since 2013 amidst rising costs of performance rights, equipment and production materials, we have had to make these small changes in order to keep up. 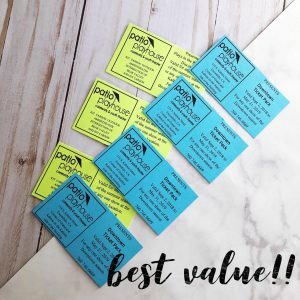 We know that we are still one of the best deals in North County theater, and appreciate both your understanding and your continued support of the great work that we are doing every day at Patio Playhouse. Finally, we are excited to announce an incredibly exciting summer line-up of three shows: the legendary Andrew Lloyd Webber and Tim Rice rock opera Jesus Christ Superstar, the family classic Annie, and Lin-Manuel Miranda’s Tony Award-winning In the Heights… we’ll see you under the stars this summer at Kit Carson Amphitheater! Thank you again for all of your support through the years and warmest regards!